Jaume Gavilán Agulló was born in 1986 in Cocentaina (Spain). He started to play trombone at the age of seven and his musical education became significant under the guidance of Javier Colomer who advised him to continue his studies in Rotterdam. In 2008, Jaume graduated from the class of George Wiegel, Jorgen van Rijen and Pierre Volders at ¨Codarts, Hogeschool voor de kunsten ¨ with the bachelor degree. 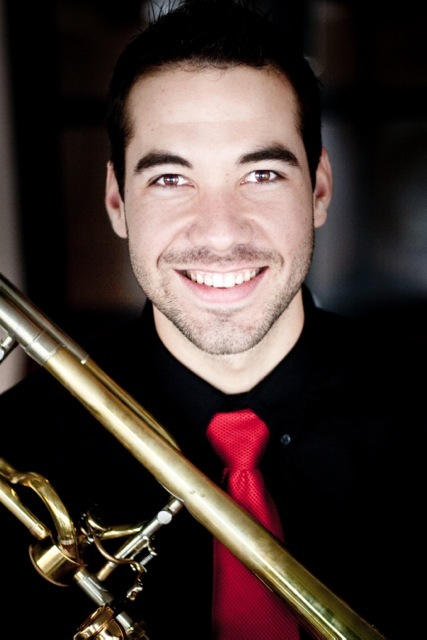 At the age of 21 he won the solo trombone position at the Netherlands Radio Philharmonic. He is also solo trombone of the West-Eastern Divan Orchestra under Maestro Daniel Barenboim and a member of the International Trombone Ensemble, as well as the Neos Brass. Teatro alla Scala of Milan, Palau de les Arts orchestra in Valencia, Staatskapelle Berlin, Koninklijk Concertgebouw Orkest, Rotterdam Philharmonisch Orkest, Orquesta Sinfónica de RTVE in Madrid, Orchestra Maggio Musicale of Florence, SWR Sinfonieorchester Baden-Baden und Freiburg, Barcelona’s Opera el Liceu, Jeunneses Musicales World Orchestra. In the summer of 2013 he had the priviledge of performing a solo concerto at the Festival of Luzern and Salzburg, under the baton of Daniel Barenboim.